Old junk is a great material for crafting with, toilet rolls, cereal boxes, egg cartons right through to empty bottles, old CDs and I’ve featured one craft below that is using old paintbrushes! If you have a pile of rubbish that you are about to through away then why not take a look through and see if any of it can be used in a crafting activity? The fish have been made with old water bottles and I just love the bright colors on them. You can find the tutorial over on Meaningful Mama. The recycled robots are super cute! Featured over on Artsy Momma. The paintbrush heros are just fab, such a great idea! See more over on Recyclart. I love the little box people, they are just adorable. The bird masks are such a great way to use old egg cartons, we get through lots in our house and I always save them for crafting with. Read more over on Sweet Paul. 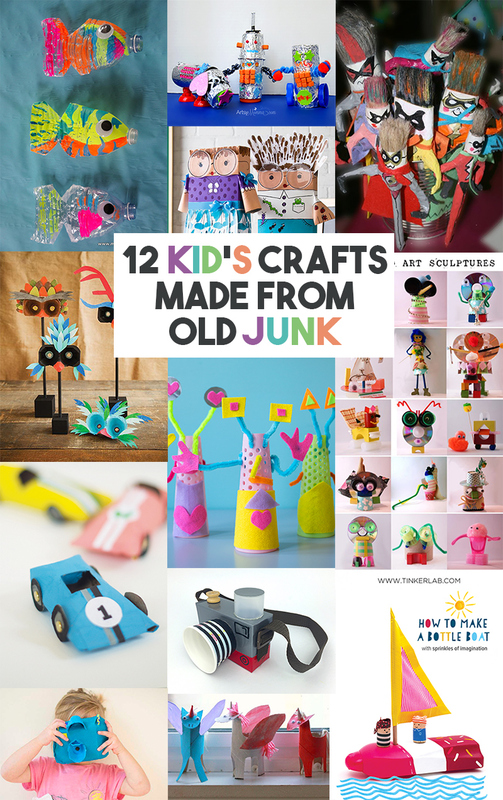 The junk model aliens are one of our crafts, we had a great time making them last week. 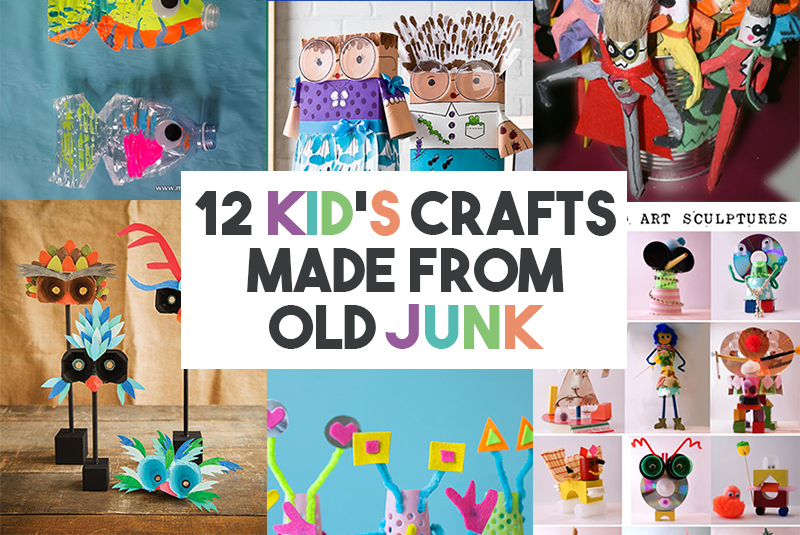 The recycled art sculptures are over on Tinkerlab and I just love them, they look awesome! The cardboard tube racing cars are fab and Tiger who is 2 and obsessed with cars would love them! Tutorial over on The Little Monster Blog. Toy cameras are a great thing to make out of old junk, this one by Molly Moo looks great and has a little drawing in the lens which is so sweet. This bottle boat craft is also by Molly Moo, my kids would love it as they are obsessed with boats. The blue camera is another one of our crafts and is made from an old egg carton. And lastly these unicorns are also made from old cardboard tubes, they are so sweet. Find the tutorial over on The Artful Parent.